There are places I’ll remember all my life though some have changed, Some forever, not for better, some have gone and some remain. All these places had their moments, with lovers and friends I still can recall, Some are dead and some are living, in my life I’ve loved them all The Beatles (Rubber Soul). Whether you dig their music or brand them as part of the whole Sixties’ naivete, the fact remains that The Beatles were enormously influential, ranging from pop culture to communication to philosophy. From Paul meeting John, to the American tour, to the build-up of Apple, to the final break-up, the story of The Beatles’ rise to fame has probably been chronicled in hundreds of books the world over. Phillip Norman’s SHOUT! The Beatles in Their Generation is a different perspective, a biography without the thoughts of the subject, done without help from the subject, in fact, but still a fascinating read of exactly that—The Beatles in their generation. Unfortunately, as things turn out, there’s more of the “generation” than The Beatles themselves. Norman delves into the age with gusto, explaining each nuance of the times, every phenomenon with sociological accuracy. You get a real good insight into the kind of life that was lived about half a century ago. Norman lays on the groundwork about the kind of culture prevalent at the times, and exactly how the time was right for the descent of The Beatles into the world. Almost half of the book is taken up with the story of the early days. Norman seems to have dug up every groupie, stalker, lawyer, and former Quarryman who was ever around to witness a Beatle event. The result is a singular record of Beatlemania, of the ups and downs of the crazy pantomime that it became. And yet, it leaves you without a conclusive picture of who the Fab Four really were. He says at the very beginning: “I would like to acknowledge the invaluable help given to me by the four ex-Beatles...Unfortunately, I cannot do so...none would agree to a formal interview.” Thus, inspite of 382 detailed pages, the reader is left without much beyond John the mocker, Paul the scrupulous, George the silent and Ringo the...well, Ringo. Norman joins the “John was the real frontman and only thinking songwriter” club and underplays McCartney’s role and contribution. Things also go a little astray in relating their passage from just another pop group to super stardom. It all seems to happen a little too quickly and remotely - we get no real insight into what it was like to be suddenly turned into demi-gods. The enormous output of songs is followed extensively, but The Beatles themselves appear as mere cogs in the songwriting machine. There is no indication of why their songs form such an important part of our consciousness even today. Norman also devotes quite a bit of space to detailing the business shenanigans that went on behind the scenes. In the end, even the spectres of Brian Epstein and Stu Sutcliffe (the supposed “fifth Beatle”) that hover over the whole book seem clearer as individuals than the four gentlemen themselves. In fact, Paul criticized the book when it was first published for its inaccuracies. 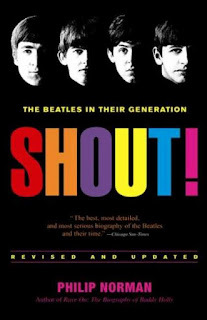 There is lots to be learned from SHOUT!, but without a Beatle account there is not much to say for it as “the definitive biography” of The Beatles, as The New York Times Book Review called it. Publication: FIRESIDE – Simon & Schuster Inc.